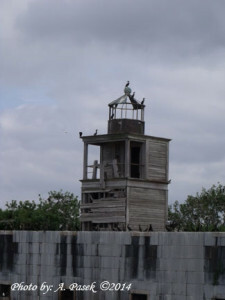 Fort Carroll Lighthouse* – Chesapeake Chapter U.S.L.H.S. The fort was sold into private ownership in 1958. In 2000 a local developer signed a lease on the property; no purpose has been announced. Now endangered and in a state of decay, the light is now on the Lighthouse Digest Doomsday List. 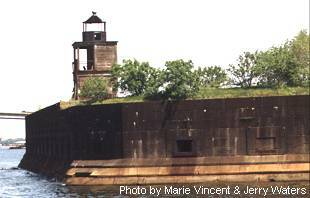 Directions: Best seen by boat, Fort Carroll lighthouse can also be seen while driving eastbound on the Francis Scott Key Bridge on the southern side of the Baltimore Beltway (I-695). It can also be seen from Fort Armistead Park. To reach Fort Armistead Park, take Exit 1 from I-695 and follow Quarantine Road south to Hawkins Point Road. Follow Hawkins Point east to Fort Armistead Road, and follow Fort Armistead Road to the park.